entro sabato 8 alle 12:00 a mano / by Saturday Dec 8th 12:00 AM hand delivered to me. Uno o più pezzi neri si autoinchiodano, annullando la minaccia per la schiodatura indiretta che il Bianco effettuerebbe se giocasse la mossa minacciata." Saranno apprezzati gioco apparente e tentativi, anche non tematici. Saranno altresì apprezzati aggiunte di qualsivoglia temi diversi. To defend the threat Black selfpins one or more of his own pieces, which would be indirectly unpinned by the threat. The judge will appreciate set and try play, even non thematic ones, and also any addition of different themes. Sono richiesti aiutomatti in 2-4 mosse (inclusi h#2.5 e h#3.5) che usino almeno un pezzo della famigli dei controsaltatori (vedi definizioni più sotto). Non c'è limite al numero di controsaltatori che possono essere usati, ma non devono esserci altri pezzi eterodossi o condizioni; il Re bianco deve essere presente. Problemi in più fasi che usino qualunque forma di gemelli sono accettati e benvenuti! Grillo: salta (sulle linee della Donna) sopra qualunque pezzo (ostacolo) e arriva sulla casella immediatamente successiva (dove può catturare). L'ostacolo può essere a qualunque distanza dal Grillo. AlfiereGrillo: grillo che muove sulle linee dell'Alfiere. ControGrillo CG: Muove come un Grillo, ma al contrario:l'ostacolo deve essere su casella adiacente al CG, che può atterrare in qualunque casella dopo. ControTorreGrillo CR: ControGrillo sulle linee della Torre. ControAlfiereGrillo CB: ControGrillo sulle linee dell'Alfiere. Required are helpmates in 2-4 moves (including h#2.5 or h#3.5) using at least one piece of the contrahopper family. For definitions see below. There is no limit on the number of contrahoppers which may be used but there must be no other fairy pieces or conditions; the white king must be present. Problems in more than one phase, using any normal form of twinning, will be allowed and indeed welcomed. Grasshopper: Hops on queen lines over any one unit (the hurdle) to the next square beyond. The hurdle may stand at any distance from the grasshopper. Rookhopper: a grasshopper confined to rook lines. Bishopper: a grasshopper confined to bishop lines. Contragrasshopper CG: Moves like a grasshopper, but in reverse: the hurdle must be adjacent to the CG, which may land anywhere on the line beyond. ContraRookhopper CR: a contragrasshopper confined to rook lines. ContraBishopper CB: a contragrasshopper confined to bishop lines. 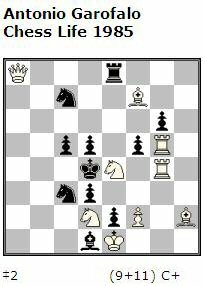 1…CGa8 2.b6 CGa7#, 1.b5 CGa4 2.b4 CGa3# & 1.b6 CGa6 2.b5 CGa5# Nice CG mates, but the moves could be all be grasshopper moves. I am looking for plenty of contrahopper-specific moves in this tourney. 1.Kd1 Sf6 2.Sc2+ Se4 3.Qc1 Sc3# & 1.Ke1 Se5 2.Se2+ CGd4 3.Qf1 Sd3# A pretty echo but with only one CG move! I am hoping for something more strategic in this tourney. Round trips. There is plenty wrong with this problem of mine (notably the repeated mating moves) but it is the only one I can find which meets the tourney requirement and uses contrahoppers of both colours. That may be a helpful hint for composers!